Colchester is doing its part to combat climate change while simultaneously benefitting businesses! An Electric Vehicle (EV) Charging Station has been installed in the parking lot of the Downsville Diner, thanks to owners Maureen and Ed Pedersen who granted the town permission to site the Station in the diner’s parking lot. Charging will be provided free of charge as an incentive for people to visit Downsville and benefit our economy. We are also hoping to increase the local-user base by encouraging more people to purchase electric cars. Although there are currently approximately 30,000 electric vehicles registered in new York, with about 980 charging locations, there is a real need for more stations in our upstate area. The Colchester EV station has been installed by PlugIn Stations online and will feature a Dual “ChargePoint” model. Users can use a ChargePoint account card, another (RFID) credit card (e.g., Visa PayWave, MC PayPass, Discover Zip, American Express Express Pass), or an app to charge their car. While waiting, they can visit the restaurants and other stores in town, visit the historic Downsville Covered Bridge and covered Bridge Park, walk the town’s fitness and walking trails, view Tub Mills Falls, and take advantage of the many things the town has to offer. “Emissions from the transportation sector are the largest contributors of greenhouse gas emissions in New York”, said DEC Commissioner Basil Seggos in a release. Electric cars provide clean energy alternatives. Commissioner Segos said, “The Town of Colchester is a strong partner in New York’s fight to combat climate change, leading by example and embracing enlightened ideas that will reduce the state’s dependence on fossil fuels and the harmful emission they produce, while simultaneously growing a green ecomony rooted in sustainability. Governor Guomo’s innovative Electric Vehicle initiatives are an important part of the state’s overall clean transportation strategy that is putting more EVs on the road and reducing the greenhouse gas emissions that pollute the planet”. The EV Charging Station is the fourth high-impact action to be completed by Colchester in order to be certified as a Clean Energy Community. The town previously adopted the NYS Unified Solar Permit (simplifying the installation of solar projects) and benchmarked energy use in municipal buildings over 1000 square feet. Also, Colchester’s Code Enforcement Officer has completed training in energy code enforcement. 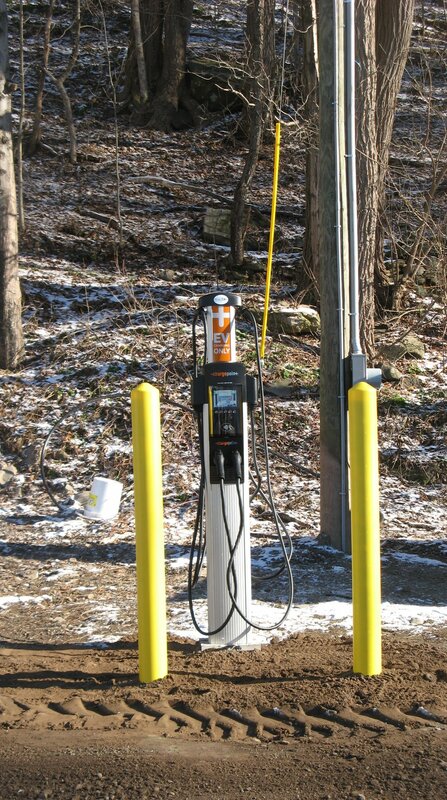 The Electric Vehicle Charging Station was funded in part by Title 15 of the Environmental Protection Fund through the NYS Department of Environmental Conservation and by the Town of Colchester. The Town of Colchester Earns Clean Energy Designation for its Commitment to Cut Costs and Reduce Energy Consumption. The Town of Colchester has been designated a Clean Energy Community by the New York State Energy Research and Development Authority, recognizing its leadership in fighting climate change, reducing energy use, advancing a clean energy future, lowering energy costs for residents and businesses and driving clean energy locally. Clean Energy Communities advance the Governor’s Green New Deal by demonstrating the importance of communities in helping New York reach its goal of having a carbon-free economy as soon as practicable and a carbon-free power grid by 2040. We invite everyone to use our Electric Vehicle Charging Station located in the parking lot of the Downsville Diner, 15185 State Highway 30, Downsville, NY 13755. This entry was posted in Town of Colchester. Bookmark the permalink.